Businessman Thomas Lommel’s ‘cosmeceuticals’ company Oliveda has its roots in the olive trees of Mallorca, but Berlin’s Neue Schönhauser Strasse was the location chosen to plant the brand’s new flagship store. The holistic products sold here are the result of seven years of development and - via an intricate biotechnological process - innovatively feature the cell elixir of the olive tree in place of the water base found in most cosmetics. Reflecting this simple yet powerful approach, the layout of the boutique is a contemporary take on the traditional European pharmacy, where an unfussy design language ensures the products are front and centre. Designed by Nadine Frommer and Christoph Stelzer of German retail identity agency DFROST, the 24 sq m space bears restored, whitewashed brick walls, which - in conjunction with sealed cement flooring and white panelling - offer an obvious nod to the brand’s Mediterranean origins. A large illustration by Italian artist Michele Tranquillini, details Oliveda’s story, and shoppers are encouraged to sample products at a freestanding counter with an integrated sink. 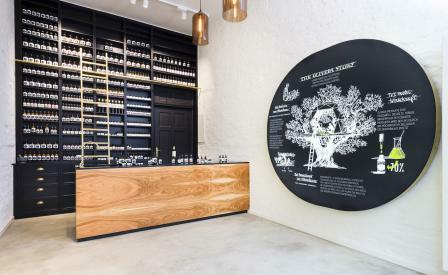 A floor-to-ceiling apothecary cabinet crafted from black-painted wood augments the pharmacy experience, further emphasised by Oliveda’s minimal packaging of brown glass flacons and jars. On an olive-shaped glass unit which showcases the store’s bestselling products, the green shade of the Oliveda cell elixir has been matched and is warmly lit by a series of hand-crafted, hanging lamps made from brown glass; each and every component touching the senses and arousing emotions.